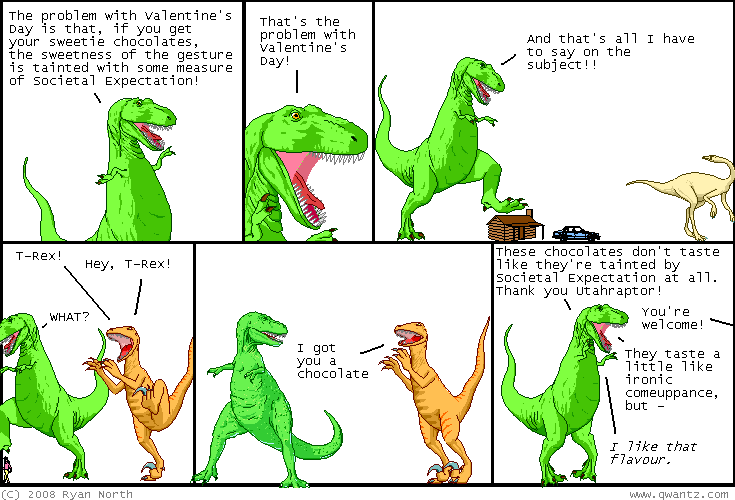 Dinosaur Comics - February 14th, 2008 - awesome fun times! And also the Dinosaur Comics store is now at TopatoCo! What this means for YOU, the loved customer, is the following: better stock tracking, the ability to order directly with credit cards, the ability to combine orders with other comics (want a Dinosaur Comics and an A Softer World and a Dresdan Codak shirt in one order? NO PROBLEM) as well as a generally more slick layout. Hooray! If you've ordered from my own store in the last few days: no worries, your order will still go through and everything is under control. If you have any questions, just let me know! I've got a lot of links to the old store so give me a little bit to get everything nicely pointed in the right place.